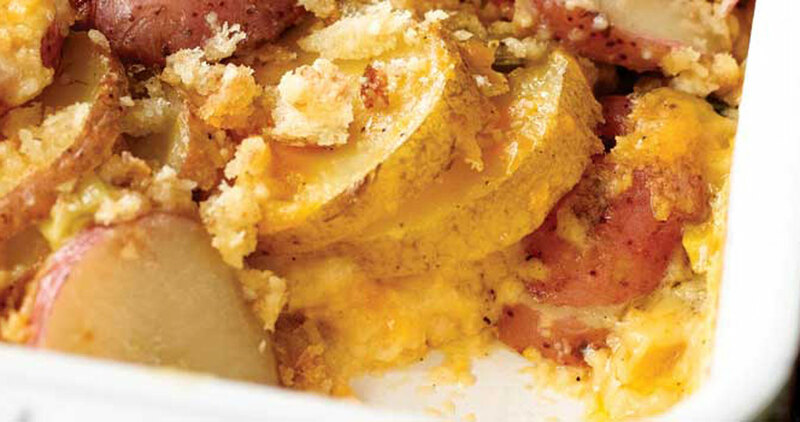 Try these scalloped potatoes from A Southern Lady Cooks for a savory side dish. Preheat oven to 325º. Lightly grease 9-inch x 13-inch baking dish. Melt ¼ cup butter in a saucepan over medium heat. Whisk in flour and cook, whisking constantly for 2 to 3 minutes or until flour is lightly browned. Whisk milk into butter mixture; bring to a low boil. Immediately reduce heat, and simmer 6 minutes, or until thickened. Add Cheddar cheese, onions, salt, and pepper. Stir until cheese melts. Spread a quarter of the cheese sauce evenly in prepared baking dish. Layer half of potatoes over sauce; top with half of remaining sauce. Repeat with remaining potatoes and sauce. Bake, covered, for 90 minutes to 2 hours. Stir together bread crumbs, ¼ cup melted butter, and Parmesan cheese. Spread evenly over potatoes. Return to oven, and bake uncovered for 20 to 30 minutes until potatoes are tender and topping is browned.